Governor Kitzhaber, listen to the voices of justice. With nothing to gain and everything to lose from coal export, our children ask only for a future and a clean Columbia River Gorge. Stop coal export and start a trend. Governor, you have an easy choice to make. Congratulations to all the wonderful families in Portland who came out to make this rally special. Our kids will remember this for a lifetime. Thank you Columbia Riverkeeper and Power Past Coal! The battle over coal export terminals in the Pacific Northwest has shifted dramatically with the announcement on May 8 by Kinder Morgan that it would walk away from plans to build a massive coal export terminal near Clatskanie, Oregon, along the Columbia River. 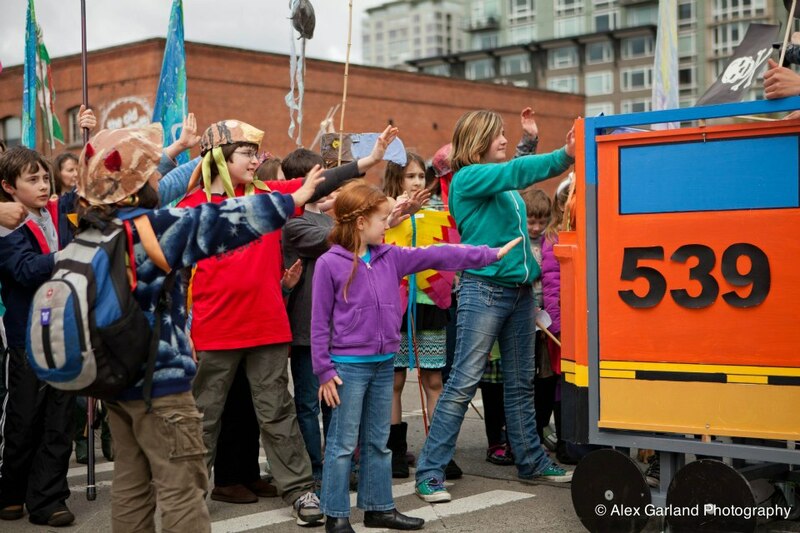 Children block the coal train at the waterfront tracks during the iMatter March on Earth Day. It’s working! The announcement is sending shockwaves across the Northwest, where coal export companies have faced unprecedented opposition from local residents, business owners, public health professionals, elected officials, farmers, conservationists, and many others. Originally there were six proposed coal export terminals in the Pacific Northwest, and now three are either dead (Grays Harbor, Washington and the Kinder Morgan’s St. Helens proposal in Oregon) or tabled (Coos Bay, Oregon). The terminals, the coal barons’ last best chance to revive an industry dying in America, would enable the vast coal deposits of the Powder River Basin in Wyoming and Montana to be shipped to Asia. But climate change advocates have joined with Oregon and Washington residents concerned about coal dust and traffic tie-ups caused by mile-long trains.